On a warm summer afternoon, Ms. Chandler was preparing a barbecue for her family, while her children played outside. She went to the kitchen to toast bruschetta to go with the meal. Taking a few bites of the baguette, she found herself unable to breathe. “I started chocking. I actually had visions of my whole life passing before my eyes,” she shares about that frightening experience. In no time, her older son, Matthew, walked into the kitchen. “It’s okay mom, I know what to do,” Matthew exclaimed. With two strong abdominal thrusts, the obstruction flew out. “I’ve never felt so relieved in my whole life,” she recalls. Matthew’s calm energy was much needed to soothe his mother’s fear as he instructed her to sit down and offered her a glass of water. “I was relieved, I thought I was going to lose my mom,” shares Matthew. Matthew, who is autistic, has learned how to perform the abdominal thrusts through the ACT CPR program in the Marshall McLuhan High School. “I have been taught by Miss. Fitzpatrick how to help someone who is choking. I remembered what to do and I helped my mom. It’s easy to remember and to do,” tells Matthew. “I am proud because I know that he could go anywhere and help if ever someone is in trouble,” says Ms. Chandler of her son. The ACT High School CPR program was set up in Marshall McLuhan Catholic Secondary School in 2012 and every year 240 students, like Matthew, learn lifesaving skills. This initiative was made possible thanks to the support of our community partner, Kiwanis Club of Toronto, our provincial partners, Government of Ontario and Hydro One, and our national health partners, Astra Zeneca Canada, Sanofi Canada, and Amgen Canada. 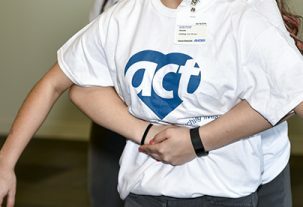 The Advanced Coronary Treatment (ACT) Foundation is the award-winning, national charitable organization establishing free CPR and defibrillator training programs in high schools across Canada. ACT raises funds to donate mannequins and teacher training to schools, and guides schools in program set-up and long-term sustainability. Over 3.6 million youth have been trained in CPR by their teachers through this lifesaving program to date.